Approximately 50% of all infertility problems are due to male factors. Some of the male factors preventing natural insemination or fertilization include ejaculatory problems, low sperm counts, abnormal sperm morphology, diminished sperm motility and function, and, often times, a combination of several of these factors. In vitro fertilization (IVF) was originally developed as a tool to overcome tubal defects in females and has since been widely utilized to achieve fertilization from men with a variety of abnormal sperm parameters. In cases in which sperm quality and quantity are severely compromised, injection of spermatozoon into the ooplasm of a mature oocyte is possible and is referred to as intracytoplasmic sperm injection (ICSI). Only a single sperm is required to perform ICSI, yet processing, isolation, and selection of a single healthy sperm from a subfertile man in an in vitro environment can be quite challenging. The objective of this chapter is to discuss the most commonly used methods of sperm separation and also to highlight the new methods currently being developed and tested for IVF and ICSI application. In addition, this chapter describes which separation process best suits the male factor in question and also the advantages and disadvantages associated with each method. 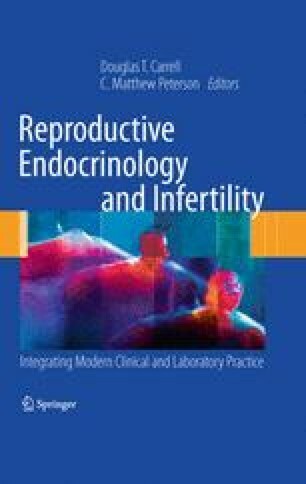 Finally, this chapter describes the stringent morphological criteria necessary to select the best sperm for IVF and ICSI.